The victims of Tuesday night's fatal shooting attack have been buried. Children eulogize their parents, "Mother, I will look over the little ones." The victims of the Tuesday night terrorist attack near Hevron – Yitzchak Imas, his wife Talia Imas, Kokhava Even-Chaim, and Avishai Shindler – were buried Wednesday. The funeral procession began in Beit Chagai. As the town does not have its own cemetery, the burials were conducted in various cities around Israel. 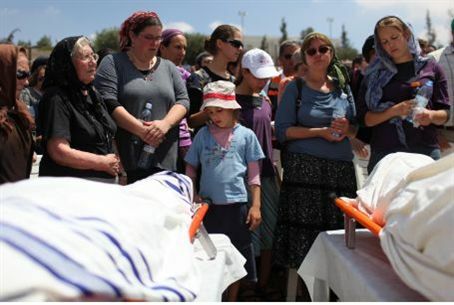 Yitzchak and Talia Imas, parents of six children, were buried in the Mount of Olives (Har Hazeitim) cemetery in Jerusalem. Avishai's uncle spoke at his funeral in Petach Tikva, “G-d wanted you close to Him, closer than any of us. We also wanted you close, but the one true Judge had different plans.” He recalled his nephew's kindness, calm disposition and humility. Knesset speaker Reuven Rivlin joined the mourners in Beit Chagai. “Terrorists see no 'green line,'” he said, referring to the 1949 armistice line which devides Judea and Samaria from the rest of Israel.